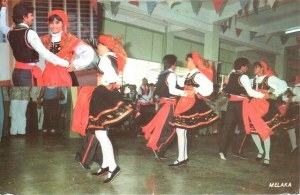 The corridinho is a form of Portuguese dance, namely in the Algarve. It is a very traditional dance in Portugal that Portuguese people like doing. Besides, you also see people enjoying the dance in the past Portuguese empire states like Goa, Daman and Diu, Dadra and Nagar Haveli, small part of Ceylon (Sri Lanka) and Macau (China).